One of the highly interesting compositions by Florent Schmitt is Mirages, Op. 70. This work exists in two versions: its original piano form composed in 1920/21, and a later orchestration prepared by the composer in 1923 and premiered in 1924 by Schmitt’s friend, the conductor Serge Koussevitzky. 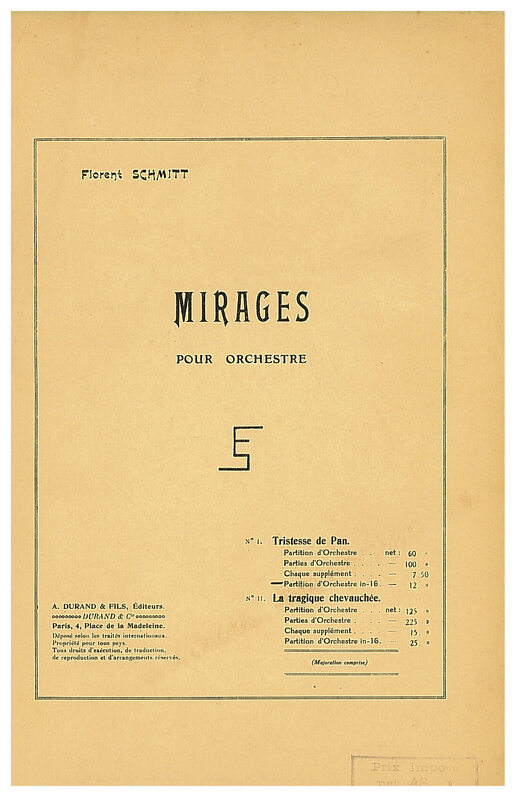 I find Mirages to be one of Schmitt’s most compelling works, even though it doesn’t fall into the composer’s famous “orientalist” group of compositions. Its two highly contrasting movements show two vital sides of Schmitt’s musical personality: ruminatively languid as well as harshly emphatic. Even in its pianistic form, this music is an implicitly symphonic conception – undoubtedly contributing to the effectiveness of the later orchestration which is so impressive not just on first hearing, but also in subsequent listening. Contributing to the effectiveness of the music is the inspiration for both pieces, which comes from literature: the French symbolist poet Paul Fort and the British writer Lord Byron. The first of the two Mirages numbers is titled Tristesse de Pan. Dedicated to the memory of Claude Debussy, the great French Impressionist composer who had died in 1918, it’s a work that is opulent and near-magical in its mood and color. 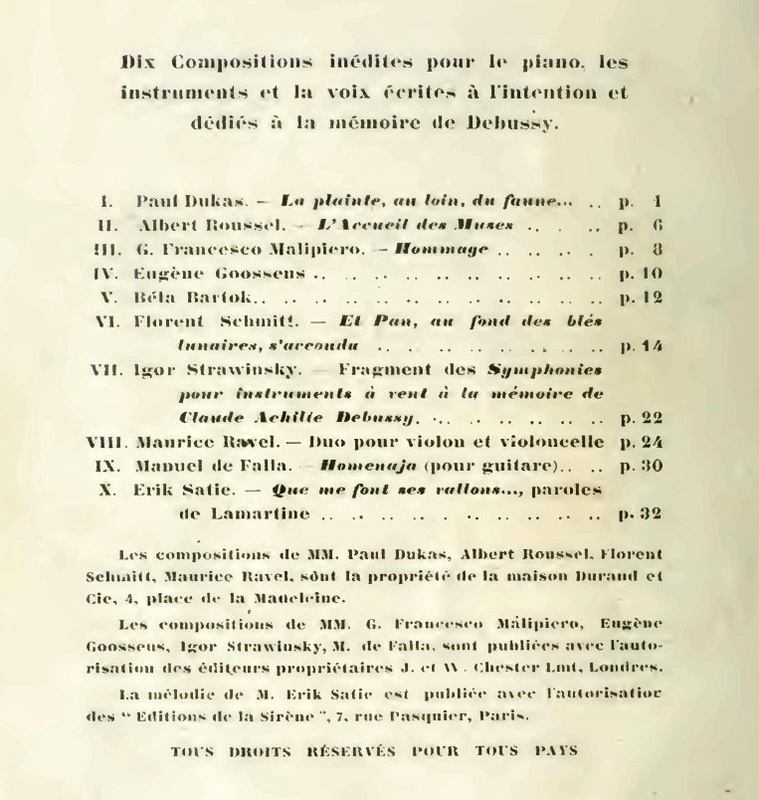 Schmitt’s piece was one of ten works created by Parisian-based composers for a December 1920 issue of La Revue Musicale, a French magazine devoted to the latest musical and cultural trends in the country. 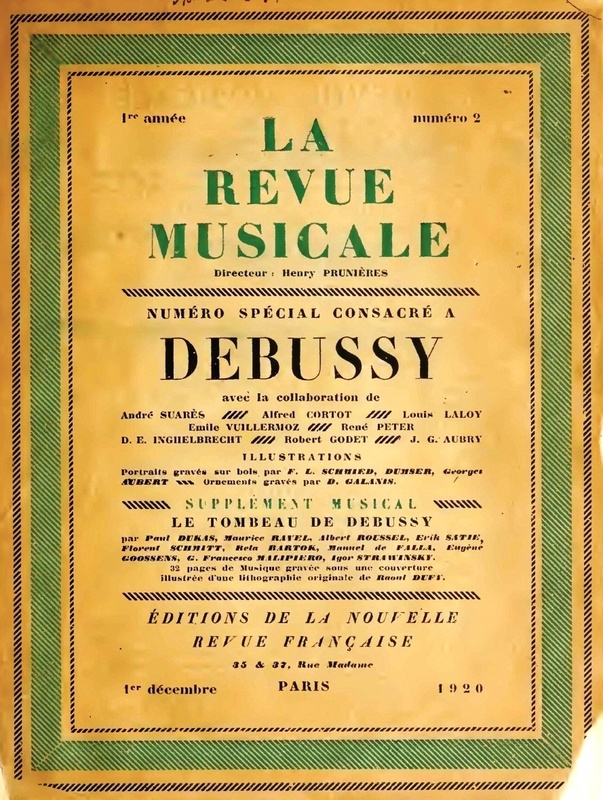 The December 1920 edition of La Revue Musicale was dedicated to the memory of Claude Debussy; the entire 150+ page magazine was devoted to the composer, including scholarly articles, reminiscences by other artists, as well as ten new pieces of music composed in his memory. 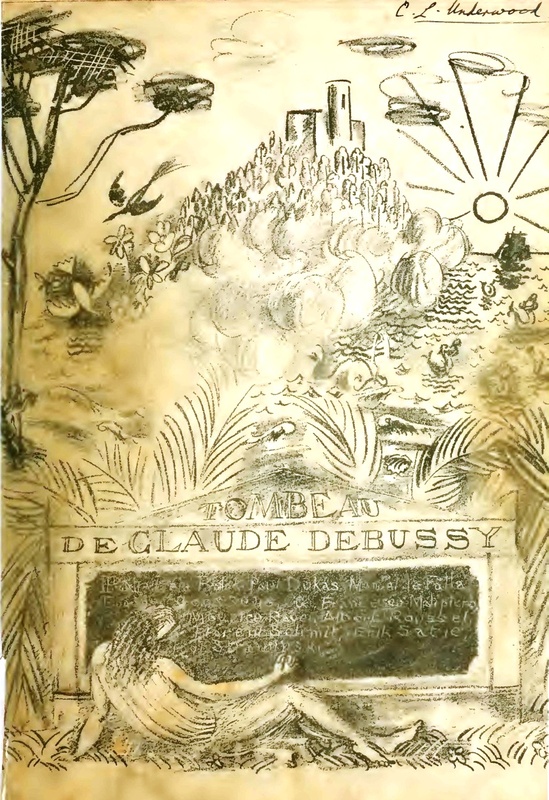 Florent Schmitt’s contribution to the Claude Debussy memorial as printed in the pages of La Revue Musicale. Schmitt’s work bears the title Et Pan, au fond des bles lunaires, s’accouda … . “… Pan leaned on his elbows deep down in the lunar wheat fields. Then, from neighboring woods, the nightingale sings to a beautiful full moon, which, on the rising tills of its voice … it seems to be resting – better than a flower on a fountain. 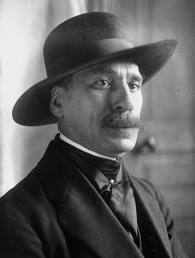 Paul Fort (1872-1960), French symbolist poet: Two of his poems were set to music by Florent Schmitt in his Six Choruses. Is he thinking about the dead gods? Is he thinking about the works that his flute revisited: the rivers, the breeze, the forests, the dawn – all works of the dead gods? In its short six-minute duration, Schmitt conveys the full range of emotions suggested by the original ballad. 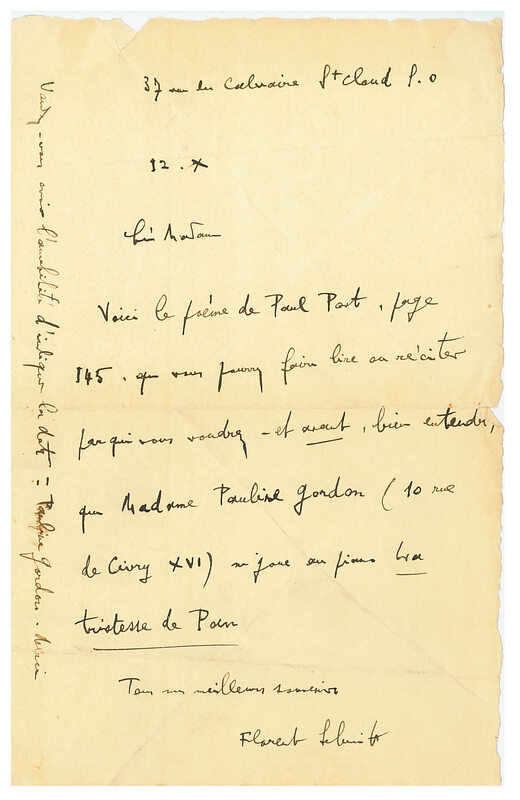 Pauline Gordon was a pianist active on the Parisian music scene during the 1930s, performing solo, chamber and concerto literature of contemporaries like Florent Schmitt and Henri Tomasi in addition to the classics. In good company: Florent Schmitt was one of ten noted composers asked to contribute new musical creations dedicated to the memory of Claude Debussy. 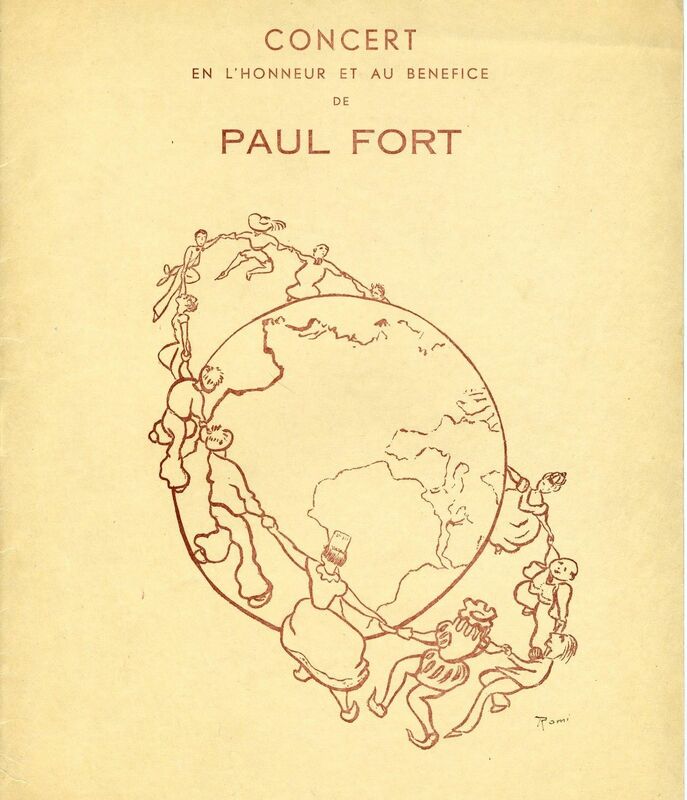 The program cover for a concert of music inspired by the poetry of Paul Fort, presented at the Paris Conservatoire on November 28, 1936, during which pianist Pauline Gordon performed Florent Schmitt’s Tristisse de Pan. 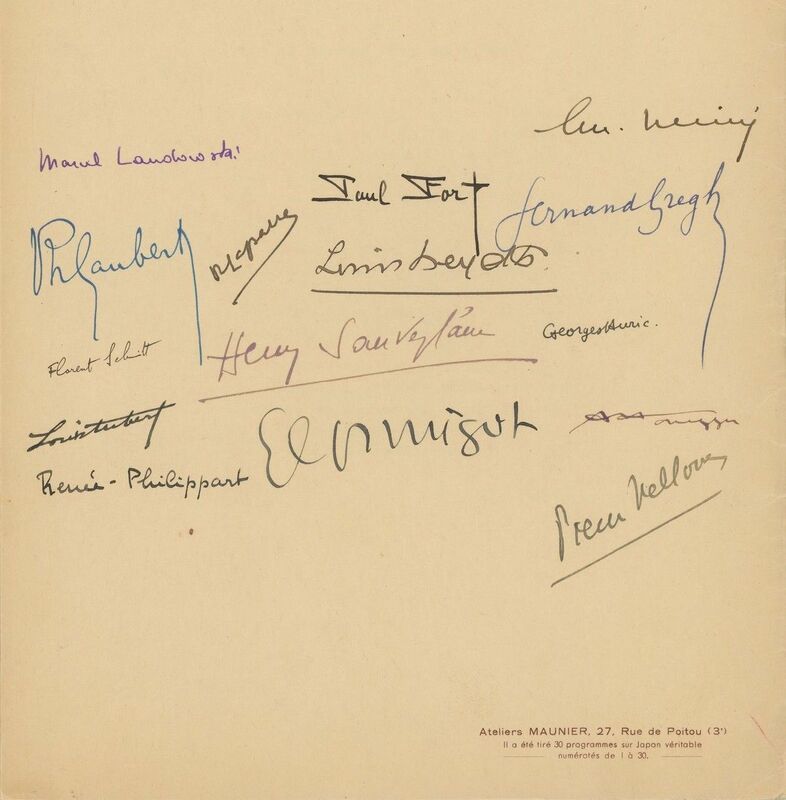 The back of the concert program shown above was signed by Paul Fort and numerous composers, among them Louis Aubert, Georges Auric, Philippe Gaubert, Arthur Honegger, Marcel Landowski, Georges Migot … and Florent Schmitt. In the second musical picture making up the Mirages, Schmitt turned to a very different subject: the poem Mazeppa by Lord Byron. Based on a legend and set in the times when the Polish kingdom stretched from the Lithuanian Baltic coast all the way to the Black Sea, Mazeppa is a nobleman accused of being the lover of a rival nobleman’s wife. He is sentenced to be tied down on a wild horse that is released into the woods. 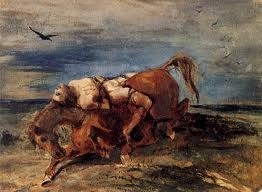 Mazeppa’s tortuous ride nearly kills him, but after the steed falls exhausted, the unconscious nobleman is rescued by the local farmers, eventually becoming the leader of the Ukrainian people. Florent Schmitt titled this movement La Tragique chevauchée, and its depiction of Mazeppa’s wild ride in the orchestrated version of the piece is overwhelming in its impact. Personally, I find Schmitt’s original piano version of this movement somewhat ineffective; in my view, the horse’s braying, bucking and galloping rhythms don’t seem to be realized too well in pianistic terms. But that is not an issue at all in the orchestration, where Schmitt is able to deliver an aural experience that is shattering in its impact. And then again … what makes the piece more than simply an orchestral tour de force is the inclusion of a plaintive theme that represents the suffering and resignation of Mazeppa. This line rises above the pounding hoofbeats to bring a kind of noble beauty to the otherwise horrific atmosphere. Florent Schmitt’s “Mirages”: Tonal pictures based on literary inspiration. The Mirages is a piece of music that has grown on me over time. Originally familiar only with the original piano version, I was most immediately drawn to the Pan movement, finding the Chevauchée harsh, awkward-sounding and overly repetitive. 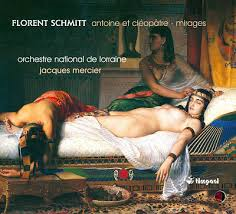 Jacques Mercier’s recording of Florent Schmitt’s Mirages, with the Lorraine National Orchestra on the Timpani label, is “the first and last word” on this music. I’ve changed that initial assessment completely now that we have a recording of the 1923 orchestration available — a marvelous interpretation featuring L’Orchestre National de Lorraine directed by conductor and Schmitt advocate Jacques Mercier. That recording has been uploaded to YouTube; the two are movements available here and here. There is also a recording of the original piano score available for audition here, courtesy of YouTube. 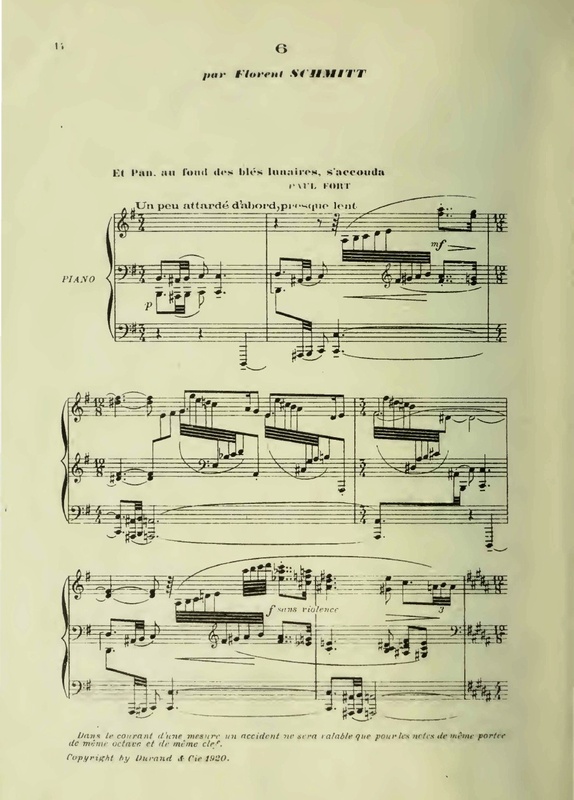 Interestingly, just as the Pan movement has been described as “closing the book” that had been opened by Claude Debussy in his Afternoon of a Faun, the Tragique chevauchée represents the last in a line of French compositions that depict “wild rides” based on various different literary inspirations. Each of these fine compositions is worthy in its own right … but Florent Schmitt’s piece is clearly the most advanced and packs the greater musical punch. At least that’s my personal view; see what you think. This entry was posted in Classical Music, Composers, French Composers, Piano Music and tagged Classical Music, Claude Debussy, Defauw, Ferroud, Florent Schmitt, French Composers, French Impressionism, Impressionism in Music, Jacques Mercier, Jorge Mester, Koussevitzky, Lord Byron, Michel Plasson, Mirages, Nones, Paul Fort, Pauline Gordon. Bookmark the permalink. Hi, just to report there’s a Florent Schmitt piece on a fresh new Anne Queffélec CD “Satie & compagnie”…. it’s the CD’s last track (29th), “Glas” from Iusiques intimes Op. 29. Although “Le Chasseur maudit” remains a hugely popular work in France (and derserves it), I was unaware that the almost perfectly unknown Ernest Guiraud composed a work of similar proportion and similar style. I am under the impression that it was composed after Franck’s more famous work. You are correct, J-C! Guiraud’s work was composed about seven years after Franck’s. It is well worth a hearing, even if it is eclipsed by the fame of the Franck. I think that Henri Duparc’s composition is also very fine, and I would love the opportunity to see it performed in concert someday.